(Newser) – One tribe lived in Ohio so long ago we don't even have a name for them. 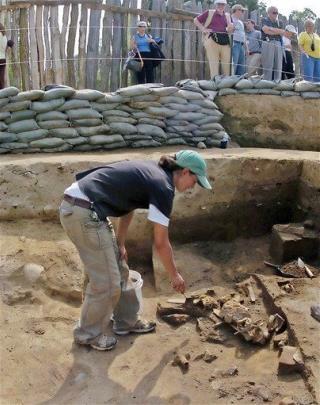 Archaeologists recently uncovered one of their 4,000-year-old homes in Lorain County and say it belonged to hunter-gatherers who visited periodically during the fall and winter, the Cleveland Plain Dealer reports. "There's nothing like this anywhere in Ohio," says team leader Brian Redmond. "It's very significant. ... We have no idea what they called themselves or what language they spoke." What archaeology tells us: They lived in a wigwam-style, U-shaped home where hickory saplings were placed in post holes along the perimeter and tied together, then covered with several cattail mats. In other words, it was "long-term" and "rather comfortable by Late Archaic period standards," says New Historian.
" . . . pottery and farming hadn't been invented yet." Really? The first evidence of farming by humans is approximately 23,000 years old. Shards of pottery found in China have been dated to approximately 18,000 years ago. Could they tell if the mortgage was paid off yet? The closest tribe is claiming ownership of the site, claiming they know it's theirs because their oral histories go back 4,000 years.